"Pulpy, peppery and sinister, served up in a comic deadpan...This scorpion-tailed little thriller leaves a response, and a sting, you will remember." --NEW YORK TIMES"The wittiest and most fun murder party you've ever been invited to." --MARIE CLAIRELONGLISTED FOR THE 2019 WOMEN'S PRIZEA short, darkly funny, hand grenade of a novel about a Nigerian woman whose younger sister has a very inconvenient habit of killing her boyfriends"Femi makes three, you know. Three and they label you a serial killer. "Korede is bitter. How could she not be? Her sister, Ayoola, is many things: the favorite child, the beautiful one, possibly sociopathic. And now Ayoola's third boyfriend in a row is dead. Korede's practicality is the sisters' saving grace. She knows the best solutions for cleaning blood, the trunk of her car is big enough for a body, and she keeps Ayoola from posting pictures of her dinner to Instagram when she should be mourning her "missing" boyfriend. Not that she gets any credit.Korede has long been in love with a kind, handsome doctor at the hospital where she works. She dreams of the day when he will realize that she's exactly what he needs. But when he asks Korede for Ayoola's phone number, she must reckon with what her sister has become and how far she's willing to go to protect her.Sharp as nails and full of deadpan wit, Oyinkan Braithwaite's deliciously deadly debut is as fun as it is frightening. 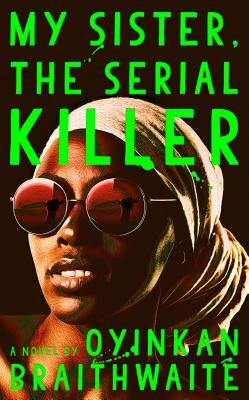 My Sister, the Serial Killer is less a murder mystery  it devotes little attention to why Ayoola is killing her boyfriends, other than that she seems to find it remarkably easy to do thanks to a sharp knife she stole from her father  and more a study in the strange complexity of sibling bonds.... Braithwaite writes in a rat-a-tat style that forces the plot along at a clip.... My Sister, the Serial Killer is a bombshell of a book  sharp, explosive, hilarious. With a deadly aim, Braithwaite lobs jokes, japes and screwball comedy at the reader. Only after you turn the last page do you realize that, as with many brilliant comic writers before her, laughter for Braithwaite is as good for covering up pain as bleach is for masking the smell of blood. MY SISTER, THE SERIAL KILLER is a darkly comic novel, one with a narrator whose complicated emotions simmer just below the surface of her completely deadpan delivery. Oyinkan Braithwaite lays out her debut in short chapters and exquisitely drawn scenes, offering just enough of a glimpse into the young women's present states and past histories to piece together at least some of their motivations.... At the end of the day, MY SISTER, THE SERIAL KILLER is at its heart an entertaining novel, by turns funny and suspenseful, while also demonstrating its author's skillful hand at character development, in the way Korede narrates both her own story and that of her sister. The title of Oyinkan Braithwaite's debut novel, My Sister, the Serial Killer, is simultaneously accurate and misleading. The book is indeed about a serial killer and her sibling, but it is not at all the pulpy slasher story you might expect. Instead, it is a playful yet affecting examination of sibling rivalry, the legacy of abuse and the shallow sexism of Nigeria's patriarchal society.... In its darkly comic depiction of two women teaming up against the powerful, abusive men in their lives, My Sister the Serial Killer feels like an ideal book for the present moment. Set in an upper-middle-class neighborhood in Lagos, Oyinkan Braithwaite's My Sister, the Serial Killer is a showstopper in many ways  a no-nonsense one with a wicked sense of humor.... Along with Braithwaite's terse and efficient prose, the novel's uniqueness hinges on the nuances in the relationship between the two sisters. Oyinkan Braithwaite's rich, dark debut about Korede, a dutiful Nigerian nurse, and her sociopathic younger sister is more nuanced than its title might suggest. Evocative of the murderously eccentric Brewster sisters from the classic play and film Arsenic and Old Lace, this fast-paced story feels breezy yet substantial.... Though this isn't a whodunit, My Sister, The Serial Killer is a riveting story with a handful of well-timed twists, mixed with laugh-out loud observations about family, co-workers, and corrupt cops. Braithwaite doesn't mock the murders as comic fodder, and that's just one of the unexpected pleasures of her quirky novel. What could have been a series of grisly murders and dead-boyfriend punch lines is instead a clever, affecting examination of siblings bound by a secret with a body count. The chapters are brisk  a page or two long, with titles like Bleach, Body, Stain. The narration is clean and efficient; the characters lightly sketched. Psychologizing is kept to a minimum. There are a few tiresome genre tropes  an annoying reliance on ellipses to convey mood, and subtext that comes emblazoned in neon.... But this book is, above all, built to move, to hurtle forward  and it does so, dizzyingly. There's a seditious pleasure in its momentum.... One of Ayoola's boyfriends confronts Korede at one point. There's something wrong with her, he says. But you? What's your excuse? This scorpion-tailed little thriller leaves a response, and a sting, you will remember.